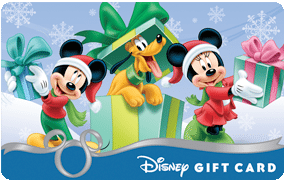 $150 Disney Gift Card Giveaway from “Mouse”cation! Well, we’re just in the gift giving mood all December-long! This week, we’re participating in another Disney Gift Card giveaway – $150 to be exact. This contest is hosted by the wonderful “Mouse”cation. Entering is very easy and free – just use the Rafflecopter form below. This contest runs from Dec 10th to the 18th (2012). But wait!! There’s more! 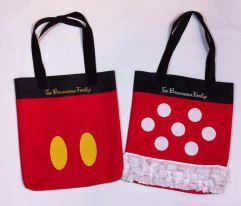 In addition to the $150 Disney Gift Card, the winner will also receive a personalized tote bag! The winner will get their choice of the ‘Mickey’ or ‘Minnie’-styled bag pictured below, and their own name will be embroidered on it. Be sure to visit all of these great Disney-related websites after you’ve ‘liked’ them. Good luck! Previous PostHidden Mickeys Go To Sea - A Review Next PostWhat would You do with a $400 Disney Gift Card? I would spend the $150 on a dinner at Be Our Guest! More gifts for my little ones! Disney vacation in 2013. Can’t wait to see the new Fantasyland! Disney is calling us! on a trip to wdw!!! Thank you for another super give away!! Disney Marathon weekend and family vacation in January!!! I will buy a nice piece of luggage from the Disney Store! I’d buy anything from the Disney store! I love that place! We are going on a Caribbean cruise on the Disney Fantasy in April, so this would come in handy for that! WE will be spending our money at WDW – have a trip for 2013 planned – it will be the first for all of our kids! I’m going for my first time ever to Disney Christmas week this year!!! This giveaway would be so awsome! Day of pampering myself at the Magic Kingdom! Get little treat/gift for myself and top it all off with the Wishes Dessert Party! I would contribute it to our next trip to WDW. We took our nieces and nephew and young son back at Thanksgiving. It was the best family trip we have ever taken. I’ve always wanted a tea set from Animal Kingdom but didn’t want to ever spend money on myself. Maybe if I won a gift card though, I might do it! If I won a gift card it would go towards our next Disney vacation. I would save it for our next trip to Disney and use it for a special dinner, and maybe a couple of souvenirs.